1st wedding anniversary presents don't often save the planet but with the symbol of this year being paper it would be hard not to find a recyclable and ethical gift! There are some pretty cool things made from cardboard from furniture to bracelets and with some time and patience you too could create a fantastic gift. The video below shows you how! There are also lots of beautiful handcrafted gifts made from recycled paper for you to choose from or secondhand paper gift ideas too. Have fun choosing the most beautiful present. The great thing about cardboard is that it is relatively inexpensive and often free, ask at your local stores if they have any that you can take away, they will probably be glad that you did. You may even be able to master a beautiful new coffee table or bedside cabinet! 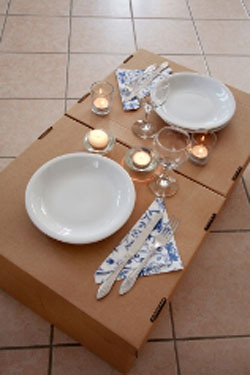 Or if not you could always make a fun table for two just like in the picture for you both to enjoy a romantic meal together, you could add to the paper theme by having paper plates, cups and cutlery as well. 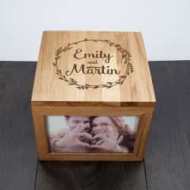 Another fun, make your own 1st anniversary gift is a puzzle where you design the picture, you can have them professionally made at CafePress.com with a photo of the two of you, or a love message or even a clue as to where you are going on an anniversary surprise. You could also stick the picture on card and then cut up the pieces, hide them round the house to make your 1st anniversary present last all day! Or you could always draw your very own treasure map and have some anniversary treasure buried in your back yard. 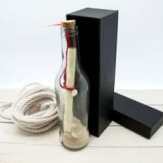 The gift could be a message in a bottle or you could be waiting there with a romantic anniversary picnic. Or you could make a lucky dip with a cardboard box being the "bucket" that you put all of the prizes in! You could wrap lots of small anniversary gifts and then let them choose an anniversary gift for that hour. 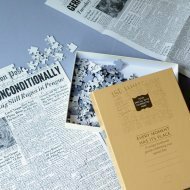 Vintage or secondhand gifts can be equally as amazing as buying a brand new item and when it comes to paper there is a fair amount to choose from. Books are the obvious secondhand choice, you could look at finding a rare 1st edition of their favorite book or one by their favorite author or a copy of a book they have always wanted to read. Don't just think reading books, vintage maps would also make a great gift. 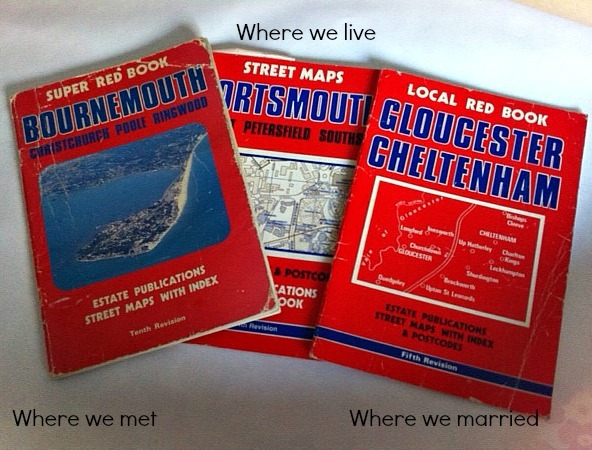 For a gift for my husband I found vintage map books of where we met, were married and live. Inside I added post-it notes as reminders of where we loved to go and memories of those trips. Vintage postcards can also be lots of fun, especially if you find one of a place that you both love. Maybe one from where you met, or were married or where you went on honeymoon. There are also really great reproductions of vintage travel maps and advertising posters. The designs on some of the early travel posters are stunning and truly works of art. We have quite a few on our walls! Seriously worth checking out the range of vintage posters at Allposters.com they have so many to choose from.